Maricruz Sanchez-Sanchez and Gerhard Mestl talk about their joint research into catalytic processes at MuniCat and how it might change both an industry and the world. 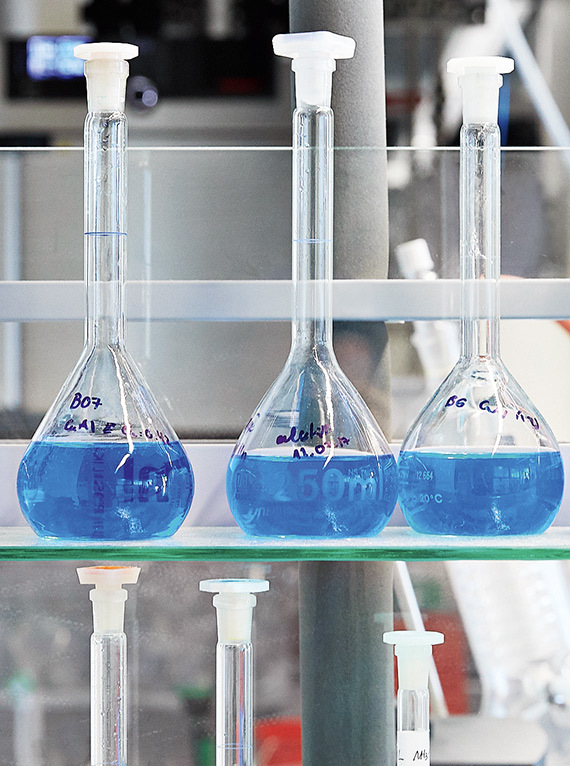 Clariant is part of more than 125 scientific and research partnerships all over the world. First of all, congratulations to you both! In 2017 you received prestigious awards for advancing the field of catalysis. Ms. Sanchez-Sanchez, you won the German Catalysis Society’s Jochen Block Award honoring outstanding young scientists. Maricruz Sanchez-Sanchez Yes, thank you. It’s an honor of course. Especially since it is the scientific community that nominates the candidates for the award. And Mr. Mestl, you were awarded the EFCATS Applied Catalysis Award by the European Federation of Catalysis Societies for »individuals displaying excellence in scientific novelty, technical achievements in development and scale-up«. Gerhard Mestl Thank you, although I’m really not too comfortable with the »individual contributions« part. We’re talking about all the work that has been done in the Department of Selective Oxidation catalysis at Clariant during the past twelve or thirteen years. If anything, my work has been very much a team effort. Which very neatly brings us to your joint research here at MuniCat. What is it you do together? Gerhard Mestl MuniCat studies and develops new or improved catalysts. We both work on selective oxidation. Your field of research is selective oxidation. Where would I find products that were made using these kinds of reactions? Gerhard Mestl We’re talking about intermediates, most of which go into polymer production, for example nylon. What makes selective oxidation such a useful tool? Gerhard Mestl Basically, the thermodynamic end result in any oxidation would be CO2. So whenever you can’t fully control the outcome of your oxidation, you end up with CO2 as a waste product. Selective catalysis at its best allows you to avoid that and yield more of your desired product. Gerhard Mestl One of the processes we’re developing could eventually be used to convert ethane into ethylene. Gerhard Mestl Ethane is the second most abundant hydrocarbon in shale gas after methane. And ethylene is used in a wide variety of industrial products – most notably polyethylene, the world’s most common plastic. What’s the advantage of using catalysis? Gerhard Mestl Today ethylene is produced in crackers using petroleum or its byproducts and vast amounts of energy. Maricruz Sanchez-Sanchez Our alternative process would use only a fraction of the energy. More importantly, almost all the carbon in the ethane goes into the ethylene, leaving little if nothing to be converted into CO2. Cracking is a huge, well-established industry. How high are the technological hurdles for your process? Maricruz Sanchez-Sanchez Crackers need to be huge if they are to operate economically. That’s why they’re usually situated close to global petrochemical hubs. Ethane is mostly found in remote places. It’s therefore seldom used as a chemical resource and often burned off onsite. Our process would work well on a much smaller scale and could be employed wherever shale gas is found. That all sounds promising. Are you also breaking new ground chemically? Maricruz Sanchez-Sanchez The catalyst material isn’t new in terms of its composition. But it’s heavily optimized. Gerhard Mestl There are metal oxides involved, the main components being molybdenum, vanadium niobium, tellurium. Gerhard Mestl They are. That’s why we developed a method of synthesis that makes very efficient use of those materials. When we’ve crystalized our materials in the lab, the remaining water doesn’t contain any leftover metals. That’s extremely important when you plan on eventually producing tons or even thousands of tons. MuniCat, the Munich Catalysis Alliance between Clariant and the Technical University of Munich (TUM), is a strategic partnership between one of Europe’s leading universities and Clariant, a global industry leader both in specialty chemicals and catalysts. 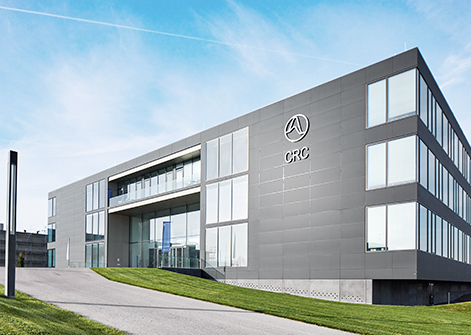 The scientific research is concentrated at the TUM Catalysis Research Center or CRC in Garching, just north of Munich. MuniCat has close ties to two of Clariant’s catalyst research sites, one in Heufeld, about an hour south of the CRC, and one in Louisville, Kentucky. Clariant contributes up to two million euros annually to the funding of MuniCat and is expected to extend the cooperation beyond its expiration date in 2022. Speaking of scaling up, how hard is it to turn lab results into an industrial process? Gerhard Mestl It’s practically our main challenge. Not everything that we can make work in a lab will be feasible on an industrial scale. For example one of our most significant achievements at Clariant is using a coating technology to cover a ceramic support material with a precisely structured catalytic surface. That’s all well and good. But both the ceramic structure and the catalytic surface have to then withstand a fall of about six meters into the reaction tube before they can even get to work. Maricruz Sanchez-Sanchez That’s a good example of something that a lab researcher would never think about if it weren’t for the close collaboration with an industry partner. How often do you both actually get together? Gerhard Mestl At least once a month. We share our latest results and give each other updates on our work. Who is involved on either side? Maricruz Sanchez-Sanchez From our side at the TUM, there’s me, the chairs of both departments involved and our Ph.D. students working on the projects. While one department deals with the experimental work, the catalytic tests and the characterization of samples, the other department works on simulations and kinetic models using our data. 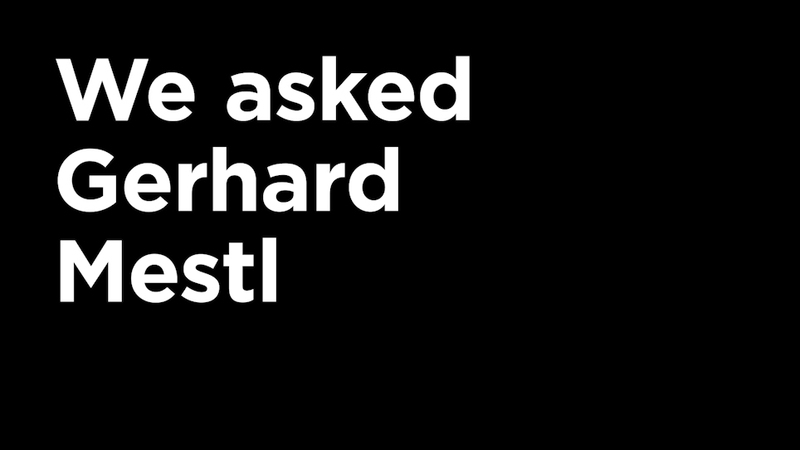 Gerhard Mestl Clariant sends about the same number of people, which include our researchers and developers as well as people from other departments such as sales and marketing whenever a project is at a stage where we would get potential customers involved – which for some is already the case. 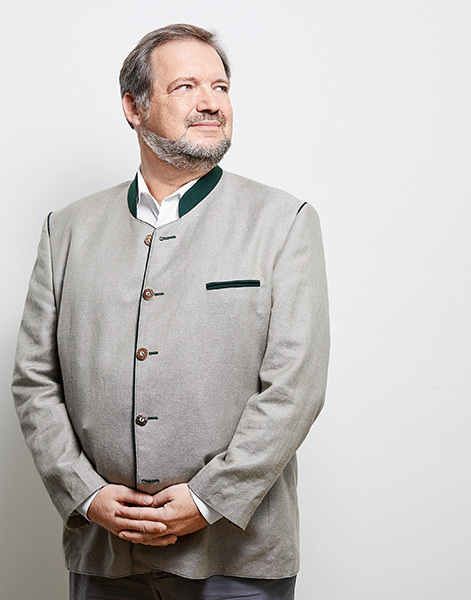 What is it that TUM brings to the table for Clariant? Gerhard Mestl Ms. Sanchez-Sanchez and her colleagues at the university work on an entirely different scale. They can try out many more catalysts than we ever could. 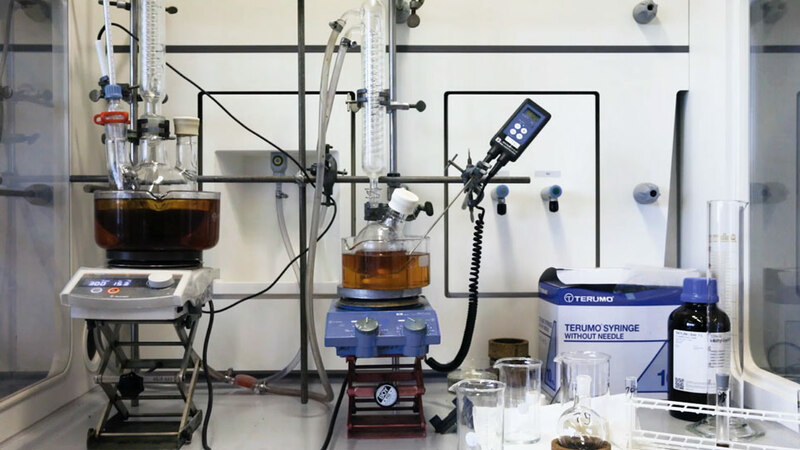 In order to optimize a catalytic process, you could vary the concentration, the time, the temperature, the pressure as well as any of the materials involved. That gives you a lot of variables and a vast spectrum of possibilities to get lost in. So their work here at the university in mapping that spectrum of possible catalyst formulations helps us avoid a lot of trial and error on a much larger scale. Maricruz Sanchez-Sanchez Keep in mind though that we don’t just try out all the possible permutations. By analyzing what works and how, we can identify the most relevant parameters. That helps us to better focus our experiments on promising areas. Gerhard Mestl I also believe that innovation only happens when bright minds get together and exchange ideas. We benefit greatly from our discussions with Ms. Sanchez-Sanchez and her team here at TUM. Through MuniCat we also gain access to people and scientific resources that even a global company such as Clariant could never maintain in-house. For example, the level of catalysis research we do with TUM requires a deep understanding of surfaces and properties down to the atomic level. For that we use electron microscopy and even particle accelerators all over Europe. Since its start in 2010 35 Ph.D. students have worked at MuniCat. And how, besides the obvious funding, does your research benefit from this cooperation? Maricruz Sanchez-Sanchez This type of industrial research poses interesting challenges to a scientist. It forces us to work within practical constraints and find feasible solutions. Doesn’t that hinder your work? What about freedom of research? Maricruz Sanchez-Sanchez Working within or around certain constraints has its own scientific merits, I think. And it makes our work more relevant to the outside world. In the most general terms, catalysis describes a chemical reaction being boosted by an additional substance. The catalyst itself is not consumed by the reaction. Catalysts are used in industrial applications to speed up reactions, reduce the energy required or to achieve higher yields of the desired product. Many of the reactions employed industrially today would be either physically impossible or uneconomical without the use of specialized catalysts. Maximizing the effect, increasing the selectivity (meaning the desired yield without by-products) and extending the lifetime of a catalyst are an exacting science – and a lucrative one at that. Can you give us one example? Maricruz Sanchez-Sanchez Many of the metals used in catalysts today are relatively rare and expensive. So companies try to reduce the amount needed or even entirely replace certain metals with cheaper alternatives. Gerhard Mestl There are also metals that have environmental, social or even geopolitical downsides. Say, if they’re only mined in politically unstable regions or under inhumane working conditions. Clariant would never want to rely on such materials. Maricruz Sanchez-Sanchez So while we may try out these materials in the lab in order to learn new things about catalytic processes in general, our primary work in developing new industrial processes will always benefit from knowing what a company like Clariant would or wouldn’t want to use. Catalytic processes rely on many different variables. 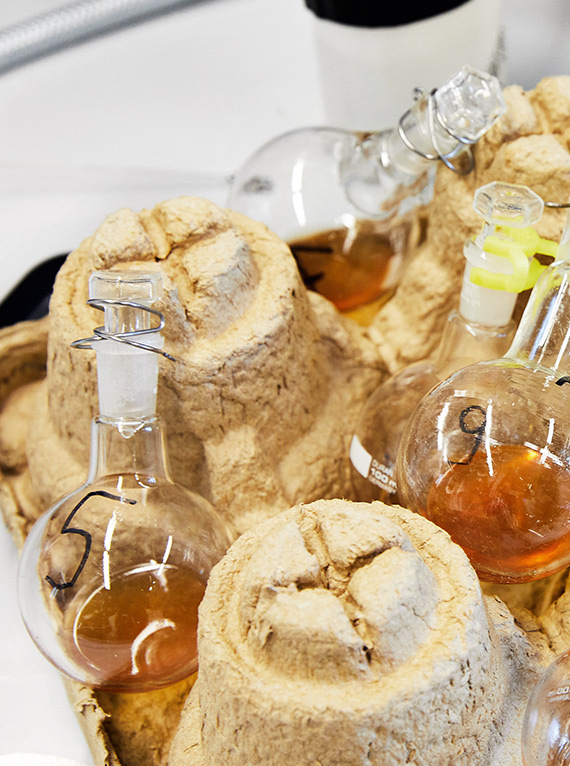 Working in tiny batches allows researchers to experiment more freely. How important are your work and industrial catalysis in general for society? Gerhard Mestl It is often said that more than 90 percent of all manufactured goods have seen at least one catalytic step in their creation. Without catalysis, many chemical reactions that we rely on would not be economically viable or even possible at all. Maricruz Sanchez-Sanchez Catalysis could help us solve some of the great problems society or even mankind face today. It may help us use alternative resources both for materials and for energy. Is that what drew you to this field of research? Maricruz Sanchez-Sanchez Of course catalysis is especially appealing because of its potential to help solve big problems. It has a green side too, if you will. It’s a powerful tool for many industries. But it also touches on very fundamental questions in science, and provides many interesting puzzles for us to solve. What specific breakthrough would you hope to see catalysis achieve within the coming decade? Gerhard Mestl I don’t think we should look for that one giant leap. Some very smart people have been working on catalysis for the past 150 years. So all the easy stuff has been done. Advances and change will come in smaller doses. Just for reference: a single percentage gain in selectivity for a given industrial process can easily result in an extra million dollars per year for a producer. So even gradual improvements in efficiency and new avenues for using more renewable resource will help make our lifestyles more sustainable. Maricruz Sanchez-Sanchez That being said, catalysis is a key factor in recovering CO2 and directly using it as a chemical resource or for energy. Something like artificial photosynthesis – which some institutes are working on – could have a massive impact, not only technologically but geopolitically. In that sense, catalysis may indeed change the world. The research alliance MuniCat is integrated into the new Central Institute for Catalysis Research. While actual trials and experimental data yield significant insights and guide research, MuniCat also develops theoretical models to better understand the mechanisms involved.